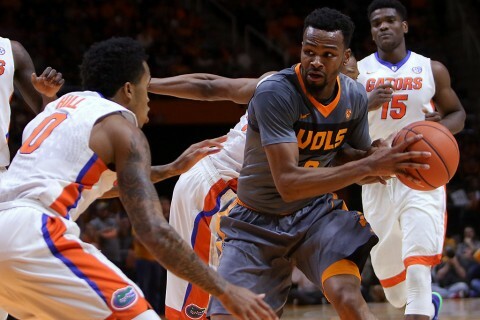 Knoxville, TN – A complete effort on both ends of the court and 26 points from senior guard Kevin Punter Jr. propelled Tennessee to an 83-69 victory over the Gators Wednesday night at Thompson-Boling Arena. Admiral Schofield followed up a career-high 22 in the Vols’ Southeastern Conference opener with 17 against Florida. Robert Hubbs III added 12 and Detrick Mostella 10 to give UT four players in double figures. Tennessee stormed out to a commanding 53-31 at halftime and lead by as many as 30 in the second half. The halftime advantage was the largest for a Tennessee team since leading Auburn by 24, 44-20, in the 2014 SEC Tournament. The 53 points were the most Florida had allowed in a half all season, including four games in which they held their opponent under that mark for the game. “That was the best 20 minutes we have played all year on both ends of the court. We were really being aggressive and swarming on the defensive end. We kept our offense moving and we really played a terrific first half,” stated Tennessee head coach Rick Barnes after the game. Punter was a big reason for the first half success, scoring 18 of his 26 in the opening half. The senior was 7-of-8 from the field in the first half, 3-of-3 from beyond the 3-point arc. Schofield had 15 of his 17 in the first half on 7-of-11 shooting. Despite a significant size disadvantage, the Vols won the rebounding battle, 49-40, and outscored the Gators in the paint, 32-24. KeVaughn Allen led Florida with 18 points, Devin Robinson had 13, Dorian Finney-Smith 12 and Justin Leon 11. “It was a great win for us. I am really happy for our guys. Again, without question it’s the best game we have played all year and certainly the best 20 minutes we have played all year,” stated Barnes. The Vols continued their perfect start to the season at home with the victory. Tennessee is now 8-0 at the friendly confines of Thompson-Boling Arena this season, a run that snapped a three-game losing streak for the Vols in SEC home openers. Tennessee’s last victory win in an SEC home opener also came against the Gators, 67-56, in 2012. The win also halted Florida’s four-game win streak in the series, the last win over the Gators was a 64-58 triumph in Knoxville on February 26th, 2013. The long-awaited debut of the Smokey Grey uniforms may not have been the key factor in victory, but the sharp look matched the sharp play in the win. The uniforms pay homage to the 1911 and 1912 Volunteers teams with a dark grey stripe across the chest. The game marked was just the second time since 1950 in which the Vols wore grey uniforms, a 2014 SEC Tournament game against Florida the other, and the first time they have ever been worn in Thompson-Boling Arena. With a 14-point win, the Vols posted the largest victory over Florida since a 16-point win (79-63) on January 31st, 2009 in Knoxville. For much of the game, the Vols flirted with what would have been the largest win since a 35-point victory (91-56) on February 10th, 1999 in Knoxville or a 22-point win (104-82) on February 5th, 2008 in Knoxville. The Tennessee Volunteers are back on the court Saturday, January 9th, 2016 as they face the Texas A&M Aggies at Thompson-Boling Arena. Tip off is at 1:00pm ET (12:00pm CT).